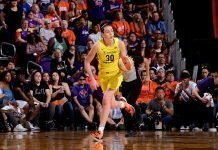 Breathe easy, y’all: Sabrina Ionescu is staying for her senior year and won’t enter the WNBA draft. I can’t say I’m surprised. She is the kind of person who likes to finish what she started. And interviewing the Oregon team for four rounds of the Tournament, I could see how tight they are. So glad she made this decision. Next articleAre you ready for this National Championship?